The Shetlands are the most northerly point in Britain, comprising around 100 islands. The islands are close to Norway and were under Norse rule until 1496, resulting in a Scandinavian resonance in the local accent and place names, such as Hulmalees and Stackaberg. The exciting wildlife and fascinating prehistoric ruins are what make the Shetlands such an enjoyable holiday destination. In the sea there are whales, otters and seals, whilst on land there are a number of indigenous species such as the Shetland cattle, goose, sheep and the world renowned pony. The Shetland Museum in Lerwick features everything you need to know about the islands’ 5000 year history, including its fishing industry, mythology and ancient Pictish carvings. There are a number of Neolithic sites on the Shetlands. 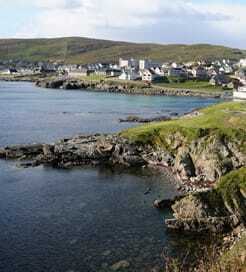 One of the most notable is in Sumburgh on Mainland’s south coast, known as ‘Old Scatness’. It is a prehistoric site made up of sandstone tower remains, known as a ‘broch’, dating back to 300BC. The island of Unst offers one of the Shetlands’ more unusual attractions, a bus shelter like no other. Equipped with a sofa, television and many other home comforts, it's the most impressive and quirky bus stop in Britain. Unst’s Hermaness Nature Reserve is a must for any birdwatcher. It has the world’s third largest colony of great skuas and a large number of gannets, fulmars, guillemots and puffins. The island of Fetlar is another hub for bird species. It is home to 90% of the UK’s Red Necked Phalarope population, an extremely rare breeding bird. There is a ferry route departing from Aberdeen on the Scottish mainland with daily crossings, lasting around half a day. There is also a faster but less frequent service from Kirkwall in the Orkney Islands. For more information, please visit our Ferries from Scotland to Shetland Islands page. 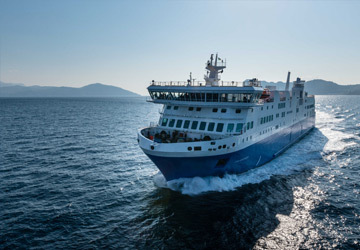 For more information, please visit our Ferries from Orkney Islands to Shetland Islands page.